Perhaps not on par with sliced bread but the indexing head idea on the GearWrench Pry Bars is very important to how easy and safe they are to use. Indexing in Pry Bars? You Betcha! I have used crowbars and just about any other kind of pry bar over the years and am reasonably certain that most of the ones with the traditional “J”-shape were designed by someone intent on frustrating me. I think whomever that was knew full well that the handle angle was sufficient to make the bar worthless in a bunch of situations where obstructions were in the vicinity – as they often were. 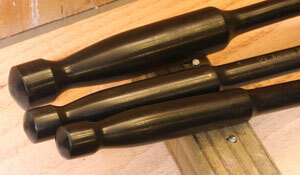 Enter the GearWrench® Indexing Pry Bars and my faith in tool designers is on the road to recovery. The GearWrench® Indexing Pry Bars are made from quality, heat-treated steel designed to exceed ANSI (American National Standards Institute) requirements for strength. That means if you bend or break one of the GearWrench® Indexing Pry Bars, you are an exceptional person – or were using a sizeable cheater extension. To help protect the metal the GearWrench® Indexing Pry Bars are given a surface treatment that inhibits corrosion. 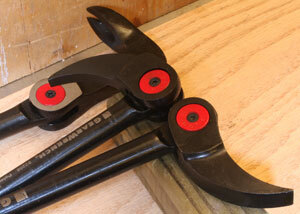 The handle portion of the GearWrench® Indexing Pry Bars is shaped to be comfortable to the hand under pressure. Considering the intended use of these bars that is an important factor. The length of that handle is largely responsible for these tools being offered in 8”, 10”, 16”, 24”, 36” and an extendable 18”-29” model. You can also find the GearWrench® Indexing Pry Bars packaged in sets that can increase the savings a bit more. We are including a look at the GearWrench® Indexing Nail Puller which allows you to make use of the indexing idea for pulling nails. Like the pry bars, the GearWrench® Nail Puller also has the Indexing head. You can index these heads in 14 positions (left) over 180-degrees! The handles (right) are simple but shaped to be comfortable to the hand. 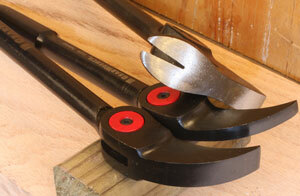 What really sets the GearWrench® Indexing Pry Bars apart is the indexing head. A push button release at the pivot point lets you select from 14 locking positions spread over a 180-degree arc. That lets you position the handle where you need it for maximum usability and safety. Vertical obstructions that interfered with traditional bars are no longer a problem. Push the button, set the head/handle where you need it for the area you are working in and get on with the job. This sounds so simple yet has a huge impact on using this kind of tool. The GearWrench® Indexing Nail Puller has the same head mechanism so you can remove nails easier and safer. Being able to put the handle where you need it so quickly helps when removing longer fasteners, particularly those near an obstruction. The rounded contact surface on the outside of the GearWrench® Indexing Nail Puller give you lots of power for pulling even large nails. Using a pry bar has never been considered a brain-straining task but using them safely and effectively at the same time could take more thought and ingenuity that we might expect. The GearWrench® Indexing Pry Bars and Indexing Nail Puller let you be safer and more effective and make both much easier to accomplish without having to find more tools. Push the button, set the head where it is best for your task and pry away. If your hand hits something now it’s your fault. The indexing head consistently held firm after adjustment throughout our evaluation. It never skipped, slipped or did anything I didn’t expect. It just stayed where I put it even when pulling on the handle “strenuously”. I also found that with the adjustment so easy and quick to make that I could set it once, pry a few times and then reset the head to take full advantage of the handle length and the room I had available without adding noticeable time to the operation. Try that with one of the dumb crowbars. The handles and their surface texture were comfortable during use. Despite the rather small diameter I never felt like I was losing my grip in part because we can put the handle in the best position for pulling on it. The technology behind the GearWrench® Indexing Pry Bars isn’t earth shaking but it absolutely does impact the ease with which you can accomplish prying, nail-pulling tasks. Being able to put the handle at the best angle for the situation makes these bars far more effective. Because you can move the handle out of conflict with obstructions the GearWrench® Indexing Pry Bars are also safer to use. The GearWrench® Indexing Pry Bars also carry attractive pricing. The 8” and 16” set shown in this review has a street price of just $52.00 and the 12” GearWrench® Indexing Nail Puller sells for $33.00! (6-28-2012) Considering the construction and materials used make the GearWrench® Indexing Pry Bars there isn’t a good reason they will not last forever. I like one-time tool purchases, especially ones with good entry prices.